If you are looking for a unique way to have fun, then you should try riding a party bus Plantation, FL service. Why take a party bus to view the city? Well it is one of the most interesting and exciting ways to check out the best destinations in Plantation, entertain your guests, and to make your trip extra special. Your Plantation party bus rental will be your special party service to different destination in the city. You could celebrate your wedding, birthday, anniversary, bachelor or bachelorette party or a reunion in a spacious and luxurious party bus service. Aside from these special occasions, you can also count on party buses to be your designated driver and take you to sports events, concerts, conferences, corporate parties, romantic dinners and homecoming dances. We also have limousine services in Plantation for these special days! 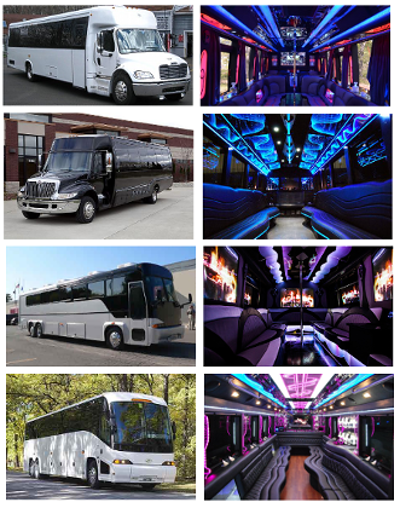 There are a variety of party bus sizes to choose from and you can make a reservation as soon as you can. When you call to place your reservation, you can learn more about the pricing and the availability of the size and type of party bus that you wish to rent. A party bus experience is definitely something that will blow your mind! Aside from top travel amenities you will also enjoy club features such as seating, lighting, audio and video equipment. For a more basic option, check out our fleet of charter bus rentals in Plantation, FL. The New J-Bar – a quaint little bar with a lot of patrons. Why is this so? Because this bar has a lot to offer when it comes to great drinks, local cuisine and a fun and relaxed atmosphere. Take the fun from your bus to this bar anytime! Regal Cinemas Broward Stadium 12 and RPX – the best cinemas in Plantation with all the most updated audio and video equipment that will make your theatre experience a totally memorable one! Smokey Bones Bar and Grill – a fantastic bar and grill where you can find the most sumptuous smoked wings. This is a wonderful bar where you can also enjoy great drinks and laid-back local folks. Party bus rental rates are according to the number of people or capacity that the bus can hold, the type of bus and the length of time that you want to rent the bus for. Rates are now more affordable than ever and the best way to find out is to give them a call. From Miami International Airport(MIA) you can ask your party bus driver to take you to your hotel or to any destination that you and your group would like to visit. You could immediately start to pregame in your own party bus the minute you arrive!